• A distinctive new landscape gateway feature complementing a rehabilitated Oregon City sign at Prairie Schooner Way, featuring a striking planting palette of native and low-water adaptive plants. • Pedestrian-friendly streetscapes and green street stormwater facilities along Washington Street, including a roundabout intersection at Clackamas River Drive. • Private property frontage improvements with strategic vegetative screening at key locations. In addition, GW developed a long-term planting approach for the 6-acre floodplain mitigation site, including almost 4,300 native deciduous and coniferous trees and 2,400 native shrubs. One significant aspect is the sheer scale of Jughandle Project. In addition to the large number of trees and shrubs planted at the floodplain mitigation site, the City planted 82 new street trees, over 500 landscape trees, and more than 25,000 shrubs and groundcover plants. 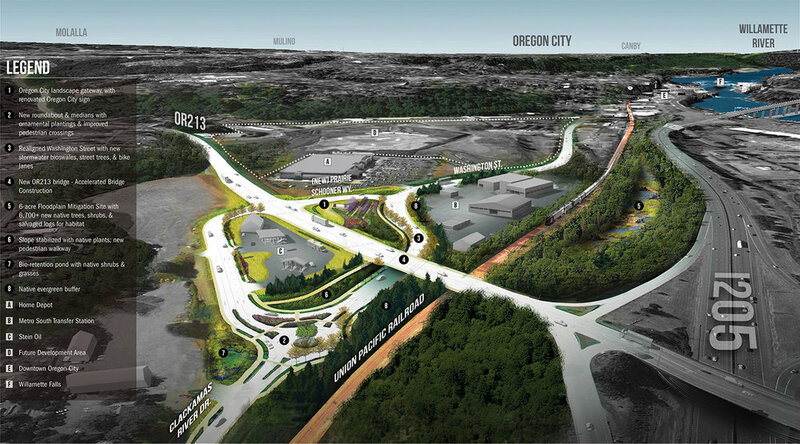 This creates a substantial positive visual impact on this gateway into Oregon City. This project received the American Public Works Association (APWA) Project of the Year Award in 2013 ($25 to $75 Million Category).